(i) The profit maximization objective ignores the timing of returns. It equates a dollar received today with a dollar received in the future. In fact, $ 100 today is valued more than $ 100 received after one year. It is because the money received in an earlier period may be reinvestable to earn more. (ii) It leads to proper and efficient channelization and utilization of surplus funds for productive business operations and other economic activities. (iii) The critics of profit maximization objective argue that it ignores the risk associated with a stream of the cash flow of the project. For example, the total profit from the two projects may be the same but the profit from one project may be fluctuating widely than the profit from the other project. The firm with wider fluctuation in profit is riskier. This fact is ignored by the profit maximization objective. (iv) It’s impossible to always accurately forecast demand, so you may end up with a glut of items that nobody really wants, reducing the profits that you were trying to maximize. (v) The profit maximization objective has greater relevance to a perfectly competitive firm than to a monopoly firm. Critics argue that a monopoly firm would be earning supernormal profit more or less automatically. (vi) Today large-scale corporate type of organizations exist. Different stakeholders such as owners, managers, customers, creditors, and employees are directly connected with the organization. The interest of each member in this organizational collusion cannot be achieved with the sole objective of profit maximization. (vii) If you outfit a facility quickly and cheaply to meet an immediate demand, you may lose out on the opportunity to build a larger facility that takes longer to build, but will yield better earnings in the future. 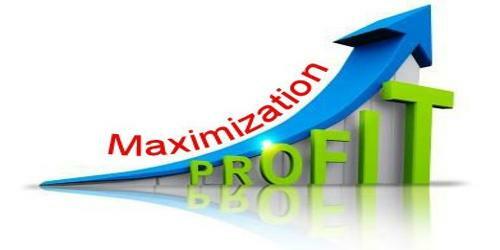 (viii) The profit maximization objective of the firm has greater relevance to short-run. In long-run, a firm cannot survive with this objective. (ix) If all firms keep profit maximization as the primary objective, they may commit unfair practice to maximize profit. (x) Maximizing profit can also be achieved by making employees work harder without paying them extra, or using materials that are harmful to the environment, such as nonrecyclable packaging.